Last Friday The Shondes played in the historic and cavernous Brooklyn Lyceum. Due to troubles with a rock show there the previous week (or something…) they had to keep the noise below 90 decibles, but they still sounded awesome, energetic and passionate and I could finally hear everything- violin, vocals, all of it! 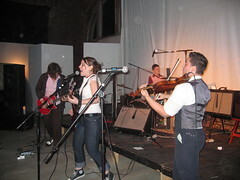 Visit their website at http://www.shondes.com for more information about their upcoming shows. This entry was posted in Brooklyn, Indie Rock and tagged Uncategorized. Bookmark the permalink.